Club Penguin Cheats by Mimo777 Club Penguin Cheats by Mimo777: Rookie Sends Gary A Message! 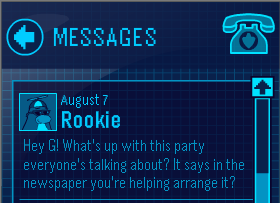 Rookie has sent Gary a Club Penguin message! Yeah, G, spill the beans! Everyone knows you are not a party planner! Let us in on your secret! I think i know whats going on. The party might just be a distraction to all the citizens of the island. While they are all caught up in the snow race, the EPF are working on catching you-know-who. Plus, it might open up a path for us to follow the foot prints. I think G will answer tomorrow. :P Waddle on! I agree with Agboy. Also remember the last one? When there was a yeti cave with foot prints leading to it! Im not saying that the yeti was herbert but what if it was something like that! I think that G is hideing something big from us. I mean, it has been very quiet, and has anyone else noticed we haven't had a feild opp in like, forever? Something is going on with G, i think he might be up to something... but why would he keep it a secret from us??? It's been rumored that they won't have the fair this year. Also, the Snow Race 2011 is to be expected on August 26, 2011. I'm betting that's what they're talking about. Hello agents. Its the Director. Stay alert on Club Penguin. The EPF has detected Herbert will strike soon.